Sometimes the snacks you buy are not what you expect. 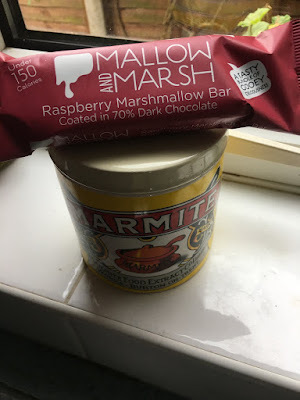 Take this Mallow And Marsh Raspberry Marshmallow bar - I'd expected this to essentially be like the Rice Crispy Marshmallow squares, but a bit more luxurious. 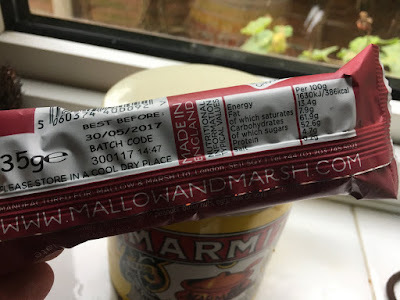 I thought it'd be a nice simple, if a little dull, review of something that I ate one Sunday afternoon while watching the TV. It isn't. This has none of the cereal or stickiness though and is something a little more special. The wrapper is very grown up for a start, it looks like health food but it says that under 150 calories is a good thing when all portion food tends to aim for 100. But we can forgive that - anyone expecting a healthy marshmallow snack is clearly conflicted. Surprisingly though it's not all sugar - it's 34% Dark Chocolate - which is where the magic starts. Most people agree that the pink marshmallows in the bag are the best ones, and this is basically a giant one but with raspberry powder inside and dark, dark chocolate on the outside to contrast. Usually I leave a bit in the pack to remind me what it was like when typing up the review - it's all gone. If i'd bought a second to share (as I often do) that would have gone too. If you were to put this on a plate and serve it with ice-cream people would genuinely think this was a pudding. 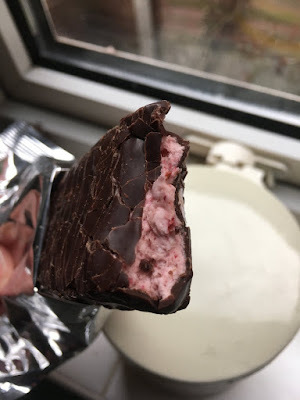 Yes - it's totally not vegetarian, and it's probably about as nutritious as just eating the 17g of sugar that it contains, but it's a little bit indulgent and a totally worthy treat. I'm not in a Sainsbury's very often but these are worth the detour (they are by the tills). They do other non-pink flavours too. Hopefully they are on bulk buy special offer soon.